My sister realized that knitting and tendonitis don’t mix, so she gave me some yarn from her stash. Included in the bag were four skeins of Silky Wool. When I saw the Honeycomb vest pattern calling for four skeins of Silky Wool, it seemed like an omen. I’m the model in the picture (note to self: in future, find something less weird to do with hands), but the vest was a b-day present for my sister. I’ll always remember this project as the one that inspired me to walk to Walgreens and purchase reading glasses. I also learned to cable without a needle. I’m glad I did. 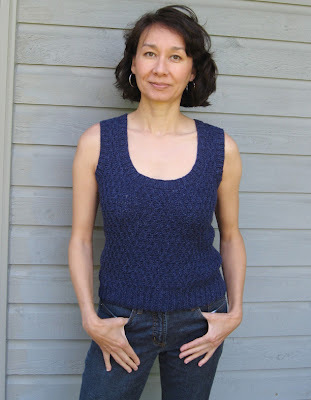 Pattern: Honeycomb by Sarah Caster, size small. Published on knitty.com. Modifications: Increased the length by .5.” Knit front and back in the round. Omitted waist shaping since the vest has several inches of negative ease. Notes: This yarn should come with a warning label. It is very stretchy. I’m not sure if I’ll ever want to knit with it again. It requires careful blocking and reshaping after washing, and I’m lazy about those kinds of things. It also took a couple days to dry even after a run through the spin cycle. the note to self made me laugh.